PLEASE NOTE: The price stated does not include VAT or shipping. VAT will be added at checkout if the delivery is to the UK or another EU country. Thank you. 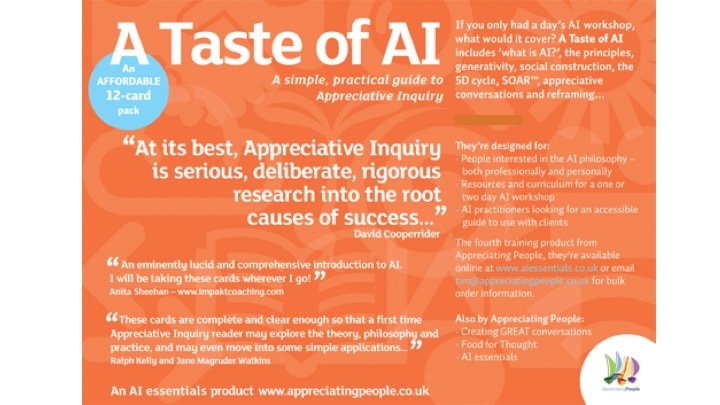 Taste 2.0 is an upgrade on the original Taste of AI pack, published in early 2014, and reflects Appreciating People’s recent training experience, participant feedback, alongside new writing in the field. There are three extra cards – Working from Strengths; the Contribution of Positive Psychology and positive emotions to AI, and Appreciative Leadership, plus some updates to the existing cards. There is also a link to downloadable additional AI resources via the AP website.